Our office has ample off-street parking, and our building is handicapped accessible. Route 24 South to Exit 4, Route 195 West. Route 195 West to Exit 8A, Route 24 South. Route 24 South to Exit 2, Brayton Avenue. Left at traffic light onto Brayton Avenue. Straight through two sets of traffic lights. Office is on your right, third corner, Brayton Avenue and Reeves Street. Enter parking lot on east side of building. Route 195 West to Exit 8A, Route 24 South. Follow directions above. Route 24 North to Exit 2, Brayton Avenue. Left at traffic light on Brayton Avenue. Straight through three sets of traffic lights. 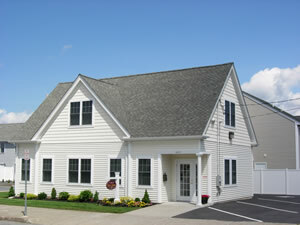 Office is on your right, third corner, Brayton Avenue and Reeves Street. Enter parking lot on east side of building. Route 195 East to Exit 8A, Route 24 South. Follow directions from the North above.